Welcome to Del Rey Divers, the oldest dive service in Marina Del Rey: For 50 years we have been servicing the bottom of boats: From boat bottom cleaning to zinc and propeller installations; We service Marina Del Rey, Channel Islands and Ventura Harbors. 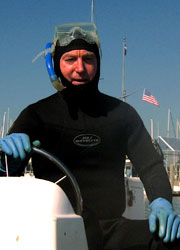 Del Rey Divers has been serving Marina Del Rey with the best in diving services, boat bottom cleaning and much more. More recently, Del Rey Divers has been serving Ventura Harbor and the Channel Islands with our professional services. We pride ourselves on being a successful family owned business and we strive to make you feel like a part of our family each and every time you do business with us. Ventura Harbor & Marina Del Rey Boat Bottom Cleaning Services at Del Rey Divers Here at Del Rey Divers, our divers have the experience, knowledge and resources necessary to perform a wide variety of boat cleaning services. From propellers to boat bottoms, we can keep your boat in the condition necessary to get maximum performance each and every time you start the engine or set sail. We are constantly looking for ways to better our services so you can have the peace of mind that you are dealing with the best each and every time. Marina Del Rey Boat Bottom Cleaning at Del Rey Divers. Tags: Boat bottom cleaning Marina Del Rey, Hull Cleaning Marina Del Rey, replace trim tab Marina Del Rey, replace zincs Marina Del Rey, Boat bottom cleaning Channel Islands/Oxnard, Hull Cleaning Channel Islands/Oxnard, replace trim tab Channel Islands/Oxnard, replace zincs Channel Islands/Oxnard, Boat bottom cleaning Ventura Harbor, Hull Cleaning Ventura Harbor, replace trim tab Ventura Harbor, replace zincs Ventura Harbor.